American Pop Rock band Train will be having a one-night concert in Manila, Philippines. 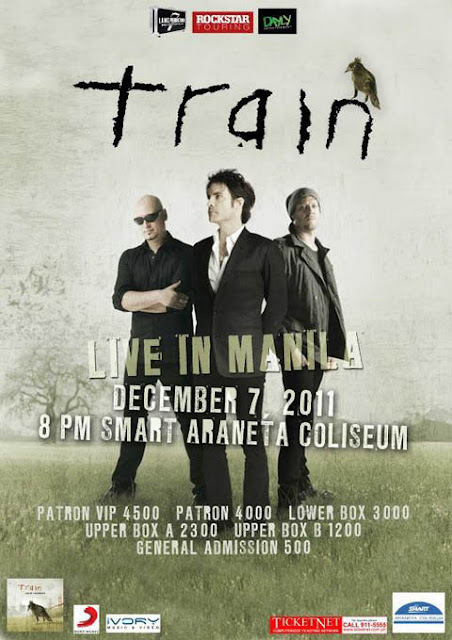 Catch them performing LIVE on December 7, 2011 at the Smart Araneta Coliseum. The group popularized the songs "Hey Soul Sister," "Drops of Jupiter (Tell Me)," among others and is composed of Pat Monahan (vocals), Jimmy Stratford (guitar, vocals) and Scott Underwood (drums, percussion). Ticket Prices: 4,500 pesos for Patron VIP, 4,000 pesos for Patron, 3,000 pesos for Lower Box, 2,300 pesos for Upper Box A, 1,200 pesos for Upper Box B and 600 pesos for General Admission. Tickets are available at Ticketnet or call (02) 911-5555 and at the Smart Araneta Coliseum Box Office to reserve your ticket now!